Walter Rauschenbusch is credited by many interpreters as the fountainhead of the social gospel in America. An American Baptist minister of German heritage, Rauschenbusch was the "prophet" of a movement that created a watershed in American religious thought. A theological educator, social activist, and church historian, Rauschenbusch is continually revisited a century after his death. This three-volume set makes available the original texts of a seminal thinker in an authorized and critical edition. Volume III brings together important texts of Walter Rauschenbusch, most significantly an unpublished book, "Christianity Revolutionary" first begun in 1891/92. This text was published under another title and with significant modifications. Here is the original, unaltered text for the first time. In addition, this volume contains Rauschenbusch's last major work, A THEOLOGY FOR THE SOCIAL GOSPEL (1917). This answered the call for a serious theological underpinning of the social gospel. 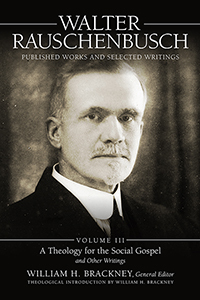 Volume III includes three shorter publications of Rauschenbusch "The Kingdom of God," that defines one of his major principles, "The Value and Use of History," that reveals the premises of his vocation, and "Why I am a Baptist," a series of editorials that provided a timely apologetic for Baptist principles. As with the first two volumes, a select correspondence section contains poetry, selections from a summer journal, and letters from Gerald Birney Smith, Vida Scudder, and William H. P. Faunce. The most extensive bibliography for Walter Rauschenbusch has been assembled in this volume. It includes a first-ever listing of archival resources from North American and European collections that will suggest and enable further investigation of Rauschenbusch. The textual content of Volume III begins with a Theological Introduction prepared by William H. Brackney, eminent historical theologian of the Baptist movement. In his introduction, drawing upon hundreds of sources, Brackney accounts for American, English, and German influences on Rauschenbusch, including his famous "Kingdom" or "Basileic" theology.